TORONTO (Dec. 19) — With today being the 100th anniversary of the first games in the National Hockey League, it is apropos to speculate that the NHL could soon evolve into a 34–member circuit. When I say “soon”, I refer to sometime in the next five–to–seven years. And after a century of games, five–to–seven years is very soon. We already know that Seattle will join the NHL shortly after Key Arena is renovated to accommodate hockey. Possibly for the 2020–21 season. This will provide the Vancouver Canucks a natural rivalry (229 kilometers/142 miles of driving distance between the cities) and balance the NHL at 16 teams per conference. But, why stop there? If the Seattle group is willing to shell out $650 million for an expansion franchise, couldn’t the NHL fetch at least that amount (perhaps more) from Quebec City and Houston? ARTIST’S CONCEPT OF KEY ARENA IN SEATTLE AFTER RENOVATION FOR HOCKEY. Commissioner Gary Bettman has frequently asserted that a potential hockey market must have a modern arena in place before being considered for expansion. And, that expansion is far–more palatable to the league than re–location (out of loyalty to current markets/for the financial outlay). Quebec City has the 18,259–seat Videotron Centre (opened Sep. 12, 2015); Houston the 18,043–seat Toyota Center (opened Oct. 6, 2003). Both are up to NHL specifications. As is the 18,972–seat Sprint Center (opened Oct. 10, 2007) in downtown Kansas City. Quebec and Houston have been linked to the NHL in loud, recent whispers, with K.C. a more distant target. Were the former to join the NHL by, say, 2023–24 (Quebec City in the East; Houston the West), the league would be balanced at 17 teams per conference. Not to mention a whole lot wealthier. In this scenario, rivalries would be generated and re–ignited. Houston and Dallas are separated in Texas by 239 miles of driving distance; the cities clash in the other three major North American leagues — the NFL, NBA and Major League Baseball. At the moment, Nashville is the closest geographic city to Dallas (664 miles northeast). Quebec City, of course, provided Montreal its most–intense rivalry while in the NHL between 1979–80 and 1994–95. 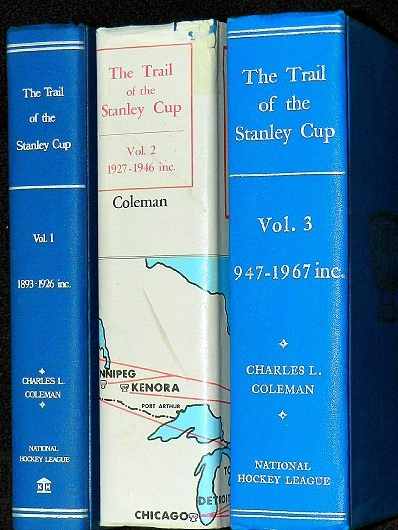 The clubs, separated by 255 kilometers/159 miles, met in the Stanley Cup playoffs on five occasions (1982–84–85–87–93); the Habs winning three. Among the wildest games in modern Stanley Cup history occurred between the provincial foes at the Montreal Forum on Apr. 20, 1984. It became known as the Good Friday Massacre, with line–brawls at the end of the second period; then prior to the third. Bob Cole and Mickey Redmond called the game for Hockey Night In Canada (brawl video: http://bit.ly/2kk6Zol). 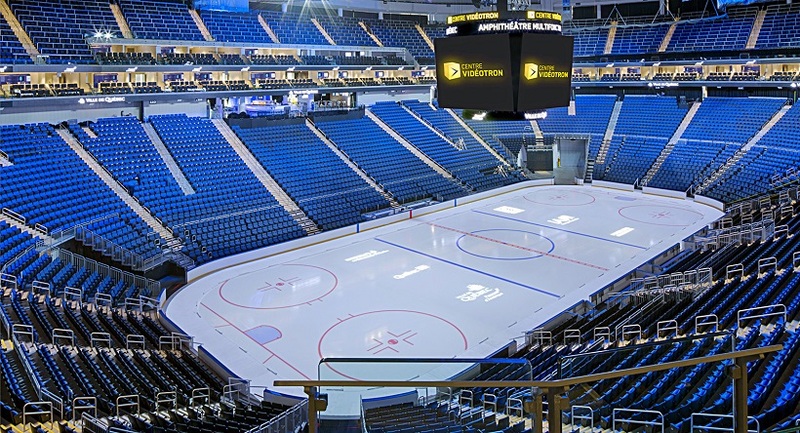 INTERIOR OF THE VIDEOTRON CENTRE IN QUEBEC CITY. So, there is ample reason, financially and competitively, for the NHL to expand by three teams before the middle of the next decade. Which could potentially pave the way, at some point, for a European division. WHY THE HURRICANES? 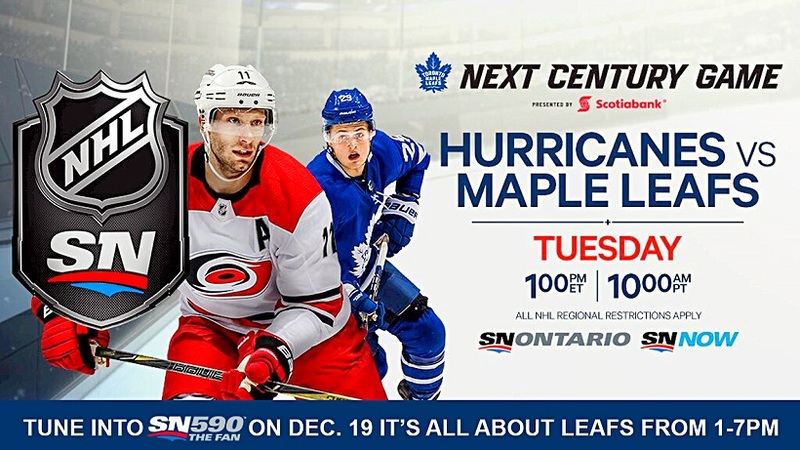 The question has been posed interminably since the NHL schedule came out last summer: Why is Carolina the Maple Leafs’ opponent for today’s 100th anniversary special at the Air Canada Centre? 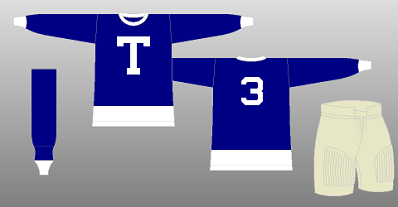 The Leafs and Hurricanes face off at 2 p.m. EST to approximate the time of the first puck drop — Dec. 19, 1917 — between the Toronto Arenas and Montreal Wanderers at the doomed Westmount Arena in Montreal (it burned to the ground on Jan. 2, 1918 and the Wanderers disbanded after only six NHL games). 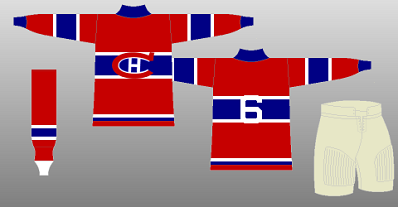 The Ottawa Senators and Montreal Canadiens were also part of the three–team NHL a century ago. Neither club has played since the outdoor game in Ottawa on Saturday. And, neither will play tomorrow (Wednesday). Why, then, couldn’t it have been arranged so that Ottawa or Montreal appear today at the ACC? Both, of course, are division rivals of Toronto, with multiple clashes during the regular season. Carolina has no history with the Maple Leafs, save for a meeting in the 2002 Stanley Cup semifinals (the Hurricanes prevailed in six games). And, the ‘Canes are coming off an exhaustive portion of their schedule: a six–game trip through Vancouver, San Jose, Los Angeles, Anaheim, Las Vegas and Buffalo, followed by a home match against Columbus a night after playing the Sabres. As such, either today’s historic occasion here in town meant nothing to the NHL… or the scheduling was poorly organized. SPORTSNET PROMO FOR TODAY’S “NEXT CENTURY” GAME BETWEEN THE LEAFS AND CAROLINA. THE TRUE ORIGINAL SIX: On the website dictionary.com, the word “original” is, quite logically, defined as “belonging or pertaining to the origin or beginning of something”. The NHL–related slogan “Original Six” is therefore a misnomer. It evolved from an oldtimers’ tournament in the early–80’s, held at the Centennial Centre in Markham, Ont. 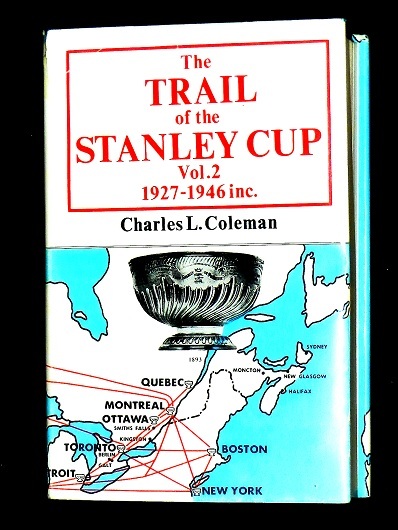 (northeast of Toronto), which featured alumni from the Boston Bruins, Chicago Blackhawks, Detroit Red Wings, Montreal Canadiens, New York Rangers and Toronto Maple Leafs. 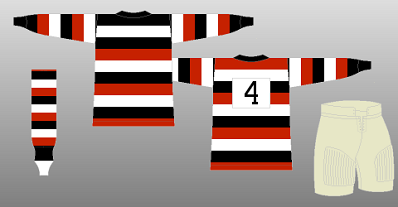 These were the six NHL teams between 1942–43 and 1966–67; the league doubled in size by adding six expansion clubs in 1967–68. None of Boston, Chicago, Detroit or New York were part of the NHL when it began play 100 years ago this afternoon. Why, then, are they included in the so–called “Original Six”? 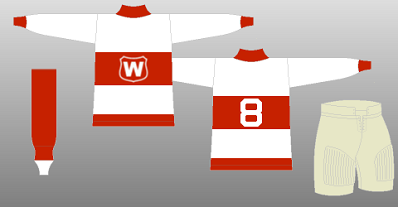 In fact, the first six franchises in the NHL were the Montreal Wanderers, Montreal Canadiens, Ottawa Senators, Toronto Arenas, Quebec Bulldogs (in 1919–20) and Hamilton Tigers (1920–21 to 1924–25). Just saying. As mentioned, the first games in the newly–organized NHL were played 100 years ago today (Dec. 19, 1917) — the Toronto Arenas and Montreal Wanderers facing off after 2 p.m. Eastern. Dave Richie (b. Oct. 1, 1881 / d. Mar. 6, 1973) of the Wanderers scored the first–ever NHL goal. Here’s an excellent story (http://bit.ly/2oOvcI2) in today’s Toronto Star by hockey historian Eric Zweig, author of the current book THE TORONTO MAPLE LEAFS: A COMPLETE ORAL HISTORY. 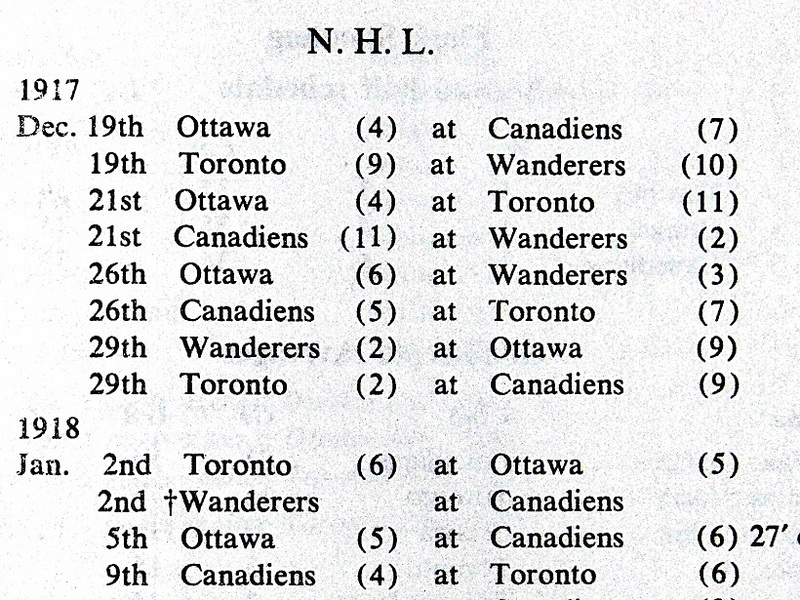 FROM THE TRAIL OF THE STANLEY CUP, SCORES OF THE FIRST NHL GAMES IN 1917–18. 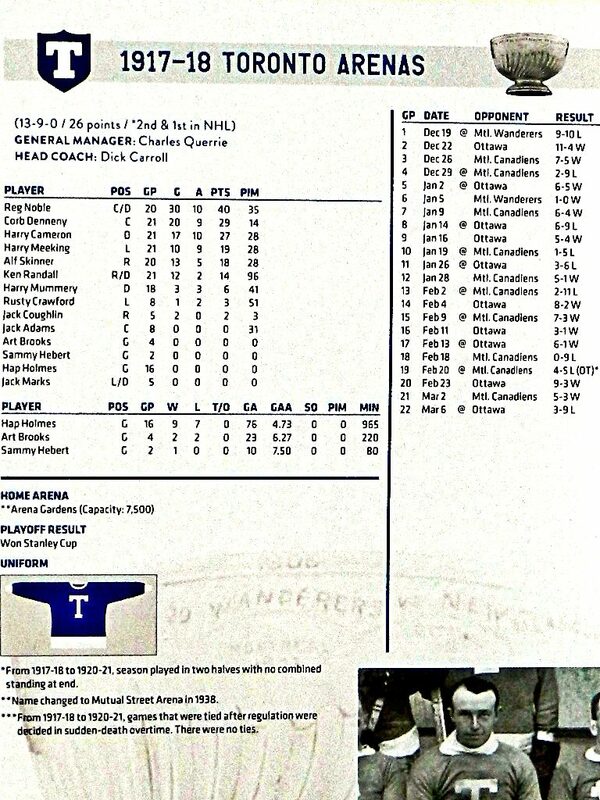 FIRST–YEAR RESULTS OF TORONTO’S NHL FRANCHISE FROM THE MAPLE LEAFS MEDIA GUIDE. It would be pretty risky for the NHL to expand to 34 teams and end up with more Carolina, Arizona, Florida and especially Ottawa money losing teams. I could see Arizona to Houston and Carolina to Quebec. Apparently Florida loses money on hockey but the owner makes money on other areana attractions so they won’t move. Then you have the Flames threatening to move if they can’t get an arena and the Sens can’t draw over 13K most games now and they look like it will be a few years or longer until they are competiitive again. They say Ottawa fans don’t like Melnyk so it won’t be pretty if Karlsson jumps ship. Worst case scenario would be he signs with the “hated” Leafs. The NHL schedule seems to become a bigger cluster**** every season, but it was likely due to MLSE not leaning on the schedule makers hard enough. This market and it’s fans are a cash cow and a taken-for-granted afterthought for the NHL offices in Manhattan. In terms of 34 teams I’m surprised how quiet the speculation is now about putting a second team in Toronto. Is it due to the satisfaction with a Leaf team with promise finally? Or is it because any talk of building an arena in the GTA has gone away? Hear me out Howard, I have a few assets and could second mortgage my 1600 sq. foot home on the GTA and you could sell some memorabelia. You think would cover the expansion costs? I could sell my 15 year old “mint” Honda Civic too. You in? Way to set everyone straight, Howard. Maybe now, people will stop referring to them as the Original Six. 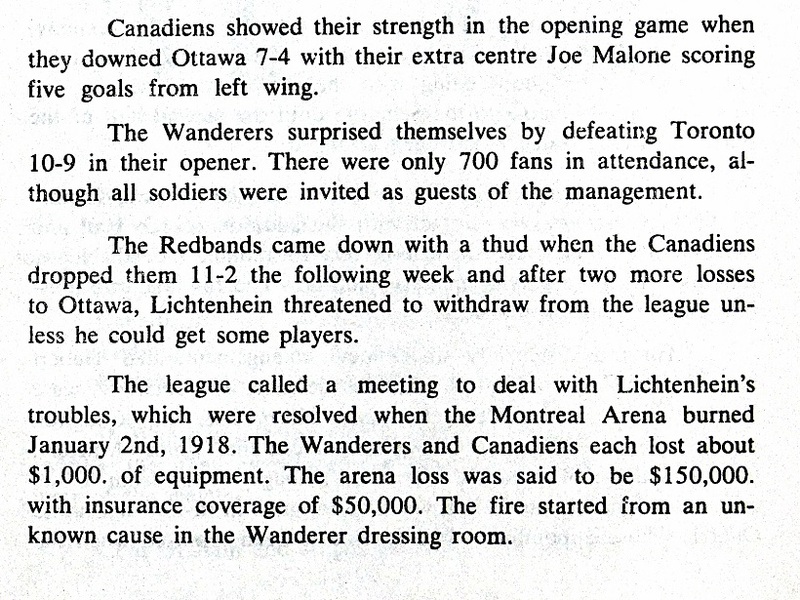 Was that the same old-timers tournament that was televised by CHCH-TV in the early 1980’s, and aired on Saturdays in the late afternoon/early evening. Thanks. Ya jeez you are right Howie! Carolina??? what the F? ?